In the 1860s the game of cricket was extremely popular and often played between neighbouring pastoral stations in Western Victoria. One day at Pine Hills station, a tall aboriginal boy stepped out from the phalaris grass and joined in one of these games of cricket. He was a natural. He showed them all how to play with skill, grace and flair. His name was ‘Unaarramin’ or Johnny Mullagh. Knockabout Cricket is an extraordinary narrative of the early life of the legendary Johnny Mullagh. Although many Australians may be ignorant of Mullagh’s sporting achievements, hebecame a skilful all-rounder who led the famous 1868 Aboriginal cricket tour of England. His feats made him one of Australia's first international cricket heroes. Playing to a largely white audience, Johnny Mullagh was a man caught between two worlds, facing racism and discrimination his entire life. Beautifully illustrated by Ainsley Walters, I particularly appreciated the dual narrative of story and additional historical facts found on each page. NeridahMcMullin’s research is thorough and comprehensive and she tells the story with dignity, spotlighting one of the great characters of Australian cricket. 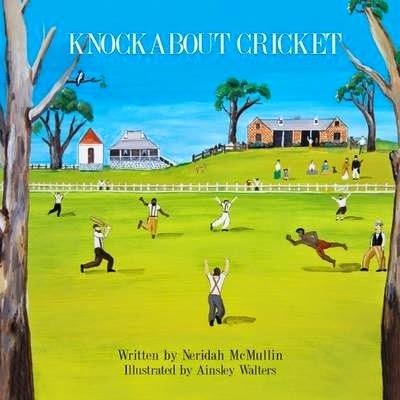 Recommended for all cricket-lovers and every Australian who is proud of our history and our sport, Knockabout Cricket is a heart-warming and inspirational picture book. With a biography in the back of the book, as well as teaching resources available, this book makes an excellent resource for every Australian classroom.